Toronto Women's Fashion Week Was All About Simplistic Fashion and Every Woman's Wardrobe—I Loved it! Toronto Women’s Fashion Week was all About Simplistic Fashion and Every Woman’s Wardrobe—I Loved it! 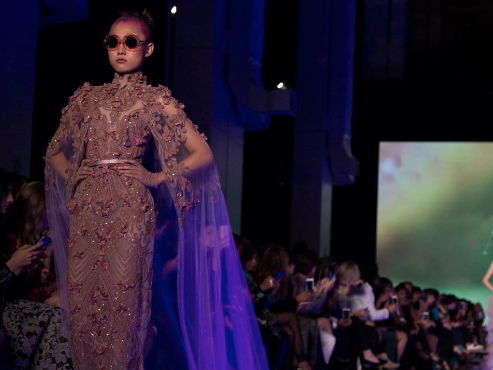 This past week, Torontonians, and fashionistas, alike, saw a grand fashion affair in the heart of the city of Toronto—Toronto Women’s Fashion Week. The buzz was around for a fairly long time, and I must say that the featured designers and the franchise itself, certainly delivered. Each and every show was elaborate—beautiful lighting, encapsulating music, and most importantly, top-notch styling! It seriously felt like the runways were taken out of the movies! Despite the intricate layout of the week-long event though, there was quite the opposite vibe coming from the various collections that were showcased. If there was a running theme throughout, something to keep in mind for when you’re getting ready to strut your style down the street in spring/summer 2018, it has to be the word ‘minimalistic.’ This seems to be an extension to what we witnessed at New York Fashion Week last month! Each one of the 17 designers at Toronto Women’s Fashion Week presented something unique and different to the audience but they also remained true to the idea of keeping it simple and chic. Taking a look back at the shows I attended, I noticed that the models’ hair wasn’t disheveled, they weren’t sporting statement lashes and other over-the-top accessories. The fashion statements this year were relatable and could easily be transferred from the ramp to every fashionista’s closet, no-doubt! The opening days were dedicated to independent Canadian designers such as Wallo, The Joga House in collaboration with Reebok, Hendrixroe, and many others. The one that stuck out the most was Wallo. Marie-Andrée Wallot’s collection consisted of soft and airy dresses and tunics. Nothing says comfort better than a silk dress that loosely sits on your body, or a tunic paired with a well-tapered pant, accompanied with a scarf to drape around the neck. This piece, in particular, seemed to draw inspiration from an Indian salwaar-kameez because it had all the works—a kurta, trousers, and the dupatta. The highlight of Wallo’s collection was the detailed prints on each of the pieces. They looked embellished and fancy but in reality, everything was simply printed on—there was no artificial beading or threadwork to make the garments look heavy and hard to carry. No wonder the models were gracing the ramp with so much ease! To add to the idea of simplicity, the girls walking for Wallo sported a very neutral makeup look. With minimal-to-no eyeshadow and liner, the only pop of color and drama came in the form of lipstick. And even that wasn’t overpowering. They used semi-soft tones on their lips paired with matte skin. So classy! The rest of the days continued with the same looks but the one that I was anticipating the most was the closing show, and Toronto Women’s Fashion Week’s international spotlight label, Amato Couture. 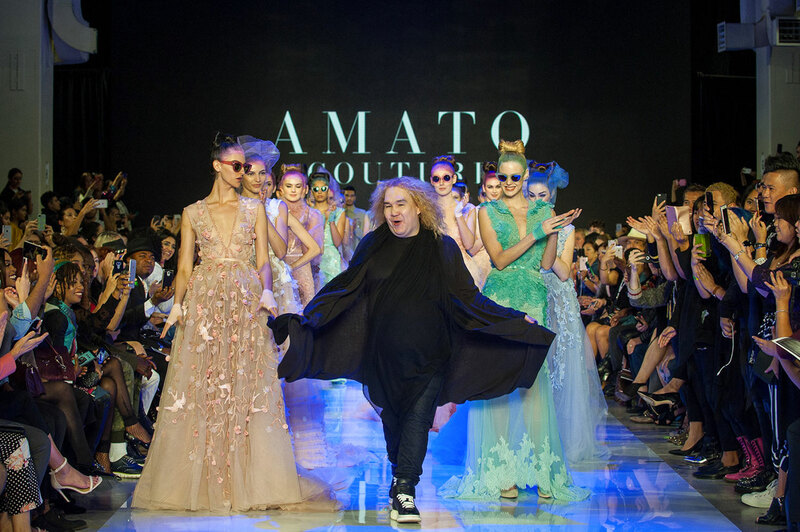 Amato Couture is the brainchild of a-list designer Furne One who collaborated with textile guru Rashid Ali, to bring to life his fashionable vision. Both One and Ali work together to help Amato reach new heights in the industry. I personally feel that these men and their company did wonders on the ramp last week, and really owned the idea of representation. I think I was lucky to be a part of the audience for a South Asian-inspired, Avante Garde label this year. Since the brand is renowned for designer dresses, it was only just that they presented some very haute-couture pieces for the crowd. One would think that the dresses would be futuristic, something like what acclaimed designers often showcase on the ramp, but I was surprised to see the complete opposite. Each one of Amato’s designs seemed like they were taken out of the everyday woman’s collection of gowns, making it easy to relate to the overall experience. The models walked down the ramp in hand-crafted dresses, lightly detailed with thread and the occasional patchwork. There were frill, net, and sheer, but that’s all as far as textures were concerned; the color palette was neutral and soft and hair was sleek and neat. This collection shows that the designer sincerely catered to the demands of every woman this year, and made his Toronto Women’s Fashion Week collection into a true want for all in the audience. Toronto Women’s Fashion Week was nowhere as big as the international fashion week’s we see come and go, but I must say that each year, the franchise takes a step in the right direction; I see this being an internationally-acclaimed event in the near future, that’s for sure. But until then, here’s one big hoora for all the creatives, TW FW’s efforts on shedding light on international designers, and of course, to simplistic fashion! Until next year! Next articleSugar, Spice, and Everything Nice—What’s In Your Chai?